Automated Storage and Retrieval Systems (ASRS) increase filing and storage efficiency and have the highest productivity rates per hour compared with other storage alternatives. 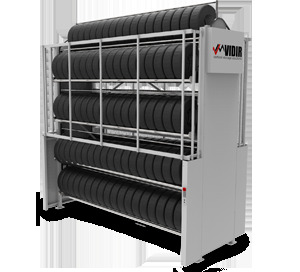 Vertical Carousels, Vertical Lift Modules and Horizontal Carousels only require one operator to retrieve files or materials as opposed to other filing systems. Carousels and Vertical Lift Modules also can be custom configured to store different types of items such as tools & dies, benchstock, tooling, electronic parts and many other applications. 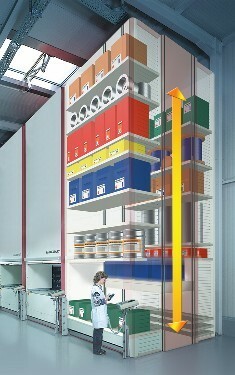 Vertical Storage Systems are space saving, productive and have extremely high return on investments. 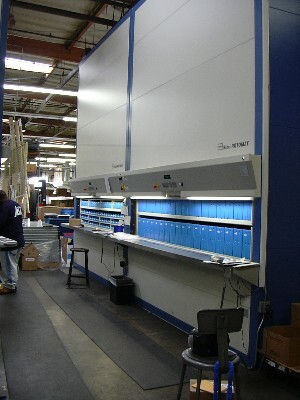 Take advantage of your vertical space or industrial warehouse with a vertical carousel, horizontal carousel, or vertical lift module ASRS system custom designed to meet your filing & storage needs. Vertical Carousels are popular replacements for vertical and lateral file cabinets when they start to take up too much office floor space. 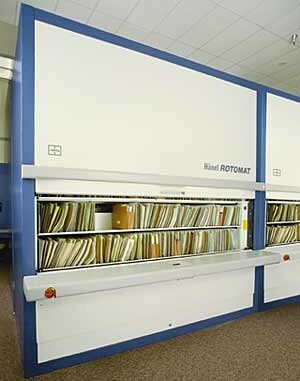 Industrial Vertical Carousels or Rotomats are popular replacements for modular storage cabinets and stock room shelving when you need more product stored in less space and a faster and more secure retrieval time. Vertical Lift Modules or Lean Lifts are also popular replacements for modular drawer storage cabinets and stock room shelving and have the ability to have multiple height settings of material storage.